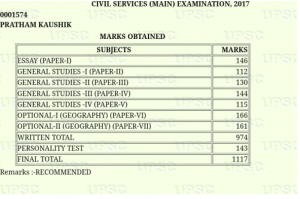 Hi friends, I am Pratham Kaushik (Rank 5 CSE 2017). My score in Geography optional is 327 (166+161). Here I am presenting my strategy for Geography. I’ll try to be specific as Geography syllabus is vast and questions are getting increasingly unconventional every year. My suggestions, whether books or coaching, are not endorsements. I hope this article can exhaustively cover all the aspects of Geography preparation. Read the syllabus thoroughly and remember all the topics. It’ll be the lighthouse of your preparation. Read any topic from at most 2-3 sources (generally a textbook and a classroom material) and then revise it multiple times. The more, the merrier. After completing a unit from the syllabus, refer to the questions of previous years (New Vishal topic wise questions) and try to frame answers. This way you can find the focus areas of the examiner and your standing at that moment. Example: In Geomorphology, the focus is on Exogenetic forces. Do not make notes for every topic as it’ll be time consuming. Rather, refer to your class notes and add on to them in your class notebook only. For this, prepare class notes on either A4 sheets or leave enough margins in your notebook. Prepare self notes for only those topics which you find very difficult to comprehend. For Paper 1, have special focus on one section, either Physical Geography or Human Geography. Know beforehand from which section you’ll attempt 3 questions. I had read extensively on Human Geography as I felt it was more rewarding. For Paper 2, make small bullet point notes for often repeated topics from standard sources. Prepare region wise maps of India from standard books in which all aspects of a region are covered like terrain, drainage, resources, agriculture, industries etc. Basically, this is the regional approach to study geography which can be adopted for Paper 2. Always try to link the subject matter of Paper 1 and Paper 2. For example, read Climatology, Population and Settlement Geography, Regional Development and Planning etc together for both papers and use examples from one paper in the other while writing answers. Geomorphology by Savinder Singh ( You can skip the Geomorphology portion of Physical Geography by Savinder Singh as it is well covered in this book). Prepare only those chapters which are there in the syllabus, focussing on Chapter 2 ‘Fundamental Concepts in Geomorphology’ and Chapter 3 ‘Theories of Land form Development’. This is an extensively written book on Geomorphology which gives a poor cost benefit ratio. Hence, prepare it selectively and make pointers to help you remember the material. This was my strongest topic in the syllabus. In fact, it was this topic only which helped me tackle the difficult Paper 1 and score 166 marks. I have seen that even in earlier years, people with good marks unarguably had a strong grasp over this topic. I would recommend the following path to cover this topic. First, read the Test Series class notes by Shabbir Sir. It’ll build a broad understanding and chronology of evolution of geographical thought. Then, read Geographical Thought by R D Dixit (Chapter 1-8, Chapter 11) and Fundamentals of Geographical Thought by Sudeepta Adhikari (Chapter 11, Chapter 13-16). If required, refer to 500+ questions and notes for this topic by Himanshu Sir. This will equip you to write extremely good answers as you’ll have precise definitions, theories, and lots of examples given originally by Geographers in their studies. Use the original quotes by Hartshorne, Febvre, Semple etc along with the names of their thesis or books. Use chronological flowcharts while answering questions. Also prepare topics like Languages, Religions, Cultural Regions and HDI, and link these with Geographical Thought. Example – Link HDI with Welfare Geography; Languages and Religion with Diffusion and Cultural Landscape of American and German Geographers. I was well prepared for questions like “Explain the concept of Time Geography.” and “Discuss the contemporary paradigms of Geography as I had made pointers for Time Geography – a) Torsten Hagerstrand and Space Time Prism, b) Darwin’s Theory of Evolution, c) Historical Geography of Radical Geographers; and answered along these pointers only. I had similar pointers for Contemporary Paradigms – a) Post QR Geographies, mainly Humanist Geography and its approaches, b) New Regional Geographies, c) Offshoots like Environmentalism, Feminist Geography, New Radical Geography. Extensively use world maps and examples in your answers. This topic is crucial as it is scoring and easy but needs good presentation. Prepare exact definitions of terms like Conurbation, Metropolitan region, Slums, Satellite towns, RUF etc along with the Human Geographers who have given these concepts. Use diagrams in settlement geography and maps in population geography as much as possible. Have some statistics handy so as to make the answer on Population Geo more effective. Terms in syllabus such as Social well-being and quality of life, Population as social capital etc should be specifically prepared with names of thinkers, examples from present world etc. with help from any class notes and internet. Both Quality of life and Social Capital were asked this year. Questions from these topics might be repeated and diversified in coming years. It is the second most important topic after Geographical Thought. It has ample scope to be very presentable with lots of diagrams, flowcharts, maps in many questions (Rimland Heartland Theories, Von Thunen, Boundaries and frontiers etc), names and books of Geographers, few examples from the present world like CPT, Von Thunen, Rostow etc. Read models and theories independently from Majid Husain and then try to link them to their original sub topic. Always, always attempt the question from this topic using all the above for better presentation, as knowledge and content will be same with everyone. Prepare pointers and short notes for each model and theory and learn each postulate by heart. Systems Analysis is a becoming a favourite of UPSC and questions are getting more diverse. Example: Geographical Systems, Application of System Analysis, Importance of system analysis etc. Prepare these from any class notes, the above mentioned book and some help from internet. Once prepared, do not look for excessive value addition in content and try to enrich your answer by flowcharts of systems. India: A Comprehensive Geography by D R Khullar (It is enough for static material for Paper 2. You need not refer to any other source. In fact, try to reduce this bulky book to your own notes in form of specific pointers, short definitions and lots of maps. Pick a sub topic from syllabus, read and underline/highlight from Khullar and paste simplified notes in the book only. Case Studies from magazines such as Yojana, Kurukshetra, Geography and You (Prepare case studies as a form of elaborated example i.e. the case study should not exceed 4-5 lines. Have at least 10 case studies ready to be incorporated in answers. Also, the case studies need not be obscure but simple, common and explanatory. Maps – You need not remember specific data for rainfall, population, road density, agricultural productivity etc for maps. Rather, simplify the complex maps given in Khullar in your own notebook. Some ways to simplify are: a) Brackets such as Low, Medium and High, b) Below, At and Above National Average, c) Shading a particular region, d) Flow maps depicting migration, trade patterns, diffusion of language from its hearth etc. example – Make an arrow of more width directed from China to India and an arrow of lesser width from India to China depicting the trade deficit. Also you can use an opening arrow over the map to show expansion of something and closing arrow to show reduction. Always label maps and diagrams and try to replicate the original boundaries of the map of India. Also have a look at the boundaries of states in case you need to draw a map of any state. In that case Maharashtra and MP should not look like rectangles. Have short notes ready for common topics mentioned in Paper 2 syllabus as Contemporary Issues, such as floods and droughts, epidemics, deforestation, soil erosion, river linking etc because it is difficult to explain such topics in 150-200 words in a lucid manner. If such notes are not there, you may end up with two pages of ineffectively answered question. How to enrich your answers? 1. In the question on religious minorities in border states, draw a map of India shading the border states, UTs and cities in which there are religious minorities. 2. In characteristics of biological deserts, draw a world map showing deep ocean regions, Artic and Antarctic region. 3. Intensity of energy crisis varies regionally. Explain. In this question draw a world map with demarcations as Regions of Severe Crisis, Moderate Crisis and Low Crisis. Second rule of presentation: Incorporate both physical and human dimensions in most questions. Except for core questions like Geographical Thought, try to provide a human angle in questions of physical nature. Example – A question on difference between Himalayan and Peninsular Drainage can be enriched by mentioning the difference in cropping pattern and industrial use of drainage water at the end. This also gives the answer an administrative orientation which is marks fetching. A pure geographical orientation is required in only a few topics. Rest of the paper, especially Paper 2 should be attempted by an administrative – geographical perspective. Third rule of presentation: Write answers along the lines of syllabus such as terrain, drainage (Geomorphology), climate (Climatology), soil or vegetation (Biogeography), environmental issues (Env Geo), Human geography parts such as population and settlement, agriculture and industries (Economic Geography), development and planning etc. Thus you can generate 7-8 points on a general topic. This will not only help in incorporating the human angle but will also provide enough diversity and content in most questions. Example: Examine the role of small towns in the regional development process. This question can easily be structured and answered by the above rule. If you start writing without a structure, even such an easy question will not fetch good marks. RDP – Small towns as centres of planning, planned sectors in small towns, small towns for pilot projects, also, you can use growth foci concept of R P Misra. Resources – Small towns aiding in resource conservation. From Physical Geo part of Paper 1, write points on Environment (role of small towns in environmental conservation) and Biogeography (Agroforestry and social forestry in small towns). Thus Rule 2 is also satisfied, as both human and physical dimensions are covered. Add a map of NCR region showing the small towns in vicinity, draw arrows showing the flow for, say migration, add some specific examples, and the answer will be diverse and comprehensive. There have been some unconventional questions in recent years but those are unconventional for all. Write as much as you know and try to include a rough diagram. You can’t have all the content. Just make sure you write little bit in each question so that the examiner has an opportunity to award you marks. For example in Pseudovulcanism question this year, I wrote on the lines of: Pseudo – fake, thus it would have something to do with flow processes like earth-flow, mud flow, creep etc and gave a reference of geysers and hot springs, which are similar to volcanic flow minus the endogenic lava. I didn’t know whether this is right or not, just took an intelligent guess. Even those questions which you don’t know, you need to think logically and write few points. Obviously in those questions, you’ll not get excellent marks, but you’ll not get a zero either. And this approach should be strictly limited to the compulsory questions which seem out of syllabus. Questions where there is a choice such as PAVE Theory of Environmental Management, if you don’t know, attempt another question. The core of my preparation has been standard books, Himanshu Sir’s (Guidance IAS) 500+ program and Shabbir Sir’s (Vajiram) Test Series Classes. I worked on content at both these places and did not write tests. Eventually I wrote 2-3 tests at Shamim Sir. Guidance 500+ program by Himanshu Sir which is integrated with test series. Benefits – Excellent content coverage in 500+ program from each sub topic of the syllabus, question paper closely resembles UPSC paper, answer booklet is in UPSC format, easy for revision as approach is question – answer based, it can even substitute your coaching class copy for most topics. Cons – Answer copies are not checked by Sir himself though he reviews them, but you can always go to him with the paper to ask anything. Pros – Approach is excellent, the way he deals with certain topics is good, his test series class notes are good (if you don’t attend the classes, find a way to get these from the market and have an overview, certain topics will be well covered). Cons – Answer copies are not checked by Sir himself though he will review them if you meet him personally, specific topics of syllabus are covered only as the program is meant as test series and not classroom coaching. Pros – Shamim Sir checks the papers himself and marking is optimum, Simple approach towards difficult questions. Cons – Question paper resemblance to actual UPSC paper is low, does not build much on content as the program is a test series and not classroom coaching. I hope I have covered all aspects and my suggestions help you score good marks in Geography. I can be reached at mpratham3@gmail.com for any specific queries. Please mention Geography Query in the subject.